On this page you will find links to what we think are the best and most trusted online resources available on the low FODMAP diet. All the links on this page have a scientific and dietetic base and have a registered dietitians input into the information that appears on the sites. Nothing can better the personalised advice from a dietitian and all the resources here will support the information your dietitians provides to you. Seeing an experienced FODMAP trained dietitian does not have to be expensive either. Many dietitians offer good value private consultation or alternative options. See our 4 Available Treatment Options for example. If you are a dietitian recommending low FODMAP resources to patients or if you are a member of the public you can trust the information you read on the websites and resources found here. So stop reading this and get clicking on the links…. Whether you have access to a dietitian or not there are two ‘must buy’ resources that will help immensely with implementing and completing the FODMAP diet. This video gives a brief overview of the low FODMAP diet for IBS and the research conducted by King’s College London in the UK. How to FODMAPs trigger IBS symptoms? A useful set of videos on the entire FODMAP diet can be found on the My GI Nutrition website which is a collaboration between American research universities and Nestle. Start with their video What are FODMAPs? The My GI Nutrition videos also include a video on How do I reintroduce FODMAPs? The website provides a symptom tracker sheet for re-challenging . In this podcast I talk to Larah from lowfodmapdiets.com and discuss the entire FODMAP Reintroduction phase with lots of useful practical tips (podcast lasts approx 40 mins). Implementing and adhering to the restriction phase of the low FODMAP diet while following other dietary restrictions or regimens makes the diet much more complex. Ensuring you are getting adequate nutrition and replacing foods appropriately on a low FODMAP diet when vegetarian or vegan is harder but it can still be done. Here are some of the best vegetarian and vegan low FODMAP resources to help you. New research has found that cooking and processing techniques, such as prolonged cooking and pickling, can decrease the FODMAP content of vegetables. For those who rely on a vegetarian or vegan diet this practical advice could increase vegetable food options on a low FODMAP diet. For further explanation on these FODMAP food processing techniques see this article and for details on new plant based foods that have had their FODMAP content recently analysed have a read of this article. For general nutrition advice when you are vegan I highly recommend you take a look at The Vegan Society website and their ‘nutrition & health pages‘. For specific nutrients that can be deficient when following a vegan diet see here. For both the general population and people with IBS it is recommended to have 25-30g of fibre each day and this recommendation continues when following a low FODMAP diet. The low FODMAP diet can reduce fibre intake, although perhaps more importantly will also reduces the intake of foods with natural laxative effects. Both of these factors can increase the risk of someone who is prone to constipation becoming more constipated on the low FODMAP diet. For those who have constipation predominant IBS (IBS-C) maintaining a good fibre intake while on a low FODMAP diet may improve the effectiveness of the diet. The articles linked below will give you some practical tips and additional information to help ensure you maintain your fibre intake from low FODMAP foods. Finally if you are really struggling to get enough fibre from food sources on the the low FODMAP diet or on your own personalised modified FODMAP diet then you can consider using a fibre supplement. It is best to discuss this with a dietitian to talk through options as adding in a concentrated form of fibre to the diet (even if it is low FODMAP) could increase symptoms. There are two excellent articles from Monash University, linked below, which provide more information on fibre supplements suitable for a low FODMAP diet and additional information on fibre & FODMAPs. Probiotics can be a useful and effective treatment option for people with diagnosed IBS or functional gastrointestinal symptoms. It can however be a bit confusing knowing which probiotics have any research evidence behind them at which ones are just good marketing! Thankfully there are some very good websites, mainly designed for health professionals, which provide links to the researched probiotcs. The Clinical Guide to Probiotic Products websites provide a brilliant resources for health professional and consumers on evidenced based probiotcs available in USA. The same Clinical Guide to Probiotic Products website is repeated but for products available in Canada. The resources links the researched probiotic strain and the product it is found in. I recommend this website to anyone searching for a probiotic to suit their gastro condition who wishes to try the available probiotics on the market. If the restriction phase of the low FODMAP diet has not improved your symptoms then probiotics could be worth a trial, however as yet there is no evidence that probiotcs will improve symptoms in those who do not respond to a low FODMAP diet (watch this space however as we are researching this!). It is best to wait until the end of the low FODMAP restriction diet to try a probiotic so you are not implementing two interventions (treatments) at once. You can also trial a probiotic after you have reintroduced FODMAPs back into your diet after completing the reintroduction phase. There is a theory that probiotics may help improve tolerance levels to high FODMAP foods but this has not been evaluated or proven. Vivomixx (formerly VSL#3) VSL#3 is the first probiotic most health care professionals had heard of for treating IBS and is probably still the one most recommended (although Alflorex prehaps has teh stronger research evidence). Confusingly its branding has changed in different countries and in Europe VSL#3 is known as Vivomixx while in the United States its trademark is Visbiome. Therefore make sure you buy these brands and not teh old brand of VSL#3. VSL#3 / Vivomixx has been used in several IBS studies and in other medical conditions and if you are interested follow the link here for a list of the research articles. In regards to IBS & FODMAPs the best quality and most important research study using VSL#3 / Vivomixx (in my opinion) was published in 2017: A Diet Low in FODMAPs Reduces Symptoms in Patients With Irritable Bowel Syndrome and A Probiotic Restores Bifidobacterium Species: A Randomized Controlled Trial. This article is open access. In the study VSL#3 was found to be just as effective as the low FODMAP diet at reducing IBS symptoms over 4 weeks. The 4 weeks low FODMAP diet reduced levels of bifidobacteria. Interestingly however patients taking VSL#3 with the low FODMAP diet did not see a reduction in their bifidobacteria. There was no additional benefit of taking VSL#3 with a low FODMAP diet in terms of reducing symptoms but it does seem these two interventions can be used together without any detrimental effects. Indeed the use of Vivomixx with a low FODMAP diet may prevent the reduction in bifidobacteria as this study showed. If you would like a really good summary of this research study then read this AGA Journals blog post: Can a Diet Low in FODMAPs Reduce IBS Symptoms in the Real World? Very recently the use of VSL#3 in all randomised controlled trials in IBS have been put under review: Systematic review and meta-analysis: Efficacy of patented probiotic, VSL#3, in irritable bowel syndrome This review highlights that the pooled data from RCT’s using VSL#3 show it is no more effective than a placebo although there is a trend towards overall symptom improvement and VSL#3 seems well tolerated in IBS. Additionally the mechanism by which VSL#3 may help improve symptoms in IBS it is still not known….. Patients feedback from using these probiotics is mixed. Some find they help improve symptoms while others find no benefit at all. A small minority find the probiotics make their symptoms worse. Prebiotics are fibres and within FODMAPs fructans and galacto-oligosaccharides (GOS) are both prebiotic fibres. Prebiotics can have many beneficial effects on gut and immune health so although a short term reduction in FODMAP prebiotics during a low FODMAP diet can improve IBS symptoms, it is important these FODMAP prebiotic fibres are reintroduced to personal tolerance to protect against any unknown long term side effects of long term restriction. There is however one prebiotic supplement that can also help reduce IBS symptoms. The prebiotic called Bimuno has been shown to reduce IBS type symptoms (abdominal pain, bloating, flatulence) in the general population. Bimuno has also been used in conjunction with a low FODMAP diet to improve gastrointestinal symptoms of those diagnosed with IBS in an RCT. The group that took Bimuno in combination with a low FODMAP diet had better symptom improvement than those who only did the low FODMAP diet suggesting a synergy between the two therapies. Despite taking the prebiotic Bimuno this did not prevent a decline of bifidobacteria from following the low FODMAP diet for 4 weeks. Interestingly this study was also the first to show that even 7 days on a strict low FODMAP diet can significantly impact the GI luminal environment by causing higher stool pH, and lower butyrate production. Finally in a recently published study the efficacy of Bimuno was compared to a low FODMAP diet. In patients with likely functional gastrointestinal disorders and flatulence symptoms 4 weeks of Bimuno increased the abundance of Bifidobacteria while 4 weeks low FODMAP diet deceased bifidobacteria. Both the low FODMAP diet and Bimuno decreased gastrointestinal symptoms significantly expect for flatulence in the Bimuno group. 2 weeks after stopping taking Bimuno the symptom reduction remained although when patients went back to eating high FODMAP foods unsurprisingly their symptoms also returned. The IBS Network is the national charity supporting people living with Irritable Bowel Syndrome. The charity provide an extensive amount of information and support for people with IBS and if you become a member you can access their IBS Self Care Programme. This provides you with comprehensive information about the nature, causes and management of IBS. I am one of the expert advisers who volunteer their time for the IBS Network. The IBS Network also provide local support groups run by trained expert patients. A treasure trove of low FODMAP information all based around the scientific research. A Little Bit Yummy is the place for all low FODMAP information. Amazing recipes that are simple and creative and don’t cost the earth with input from dietitians so you know they are suitable. For some more fantastic and practical low FODMAP recipes I love Cook Low FODMAP even though it is not being updated with anymore new recipes unfortunately. 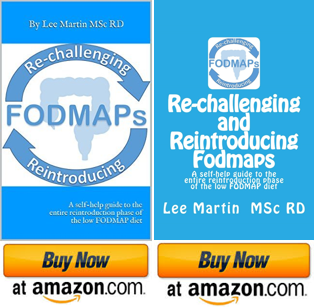 Reintroducing FODMAPs the only website dedicated to the reintroduction phase of the low FODMAP diet. Got a question on how to challenge and reintroduce FODMAPs? Check out the extensive FAQ section on the website. All food products by FODY are certified low FODMAP by the Monash University programme. Their products are available in the USA & Canada (see here) and have recently started shipping low FODMAP products to the UK (see here). They also have great information on the website. It is very hard for a Facebook group to create a trustworthy and professional support group. I was very actively involved in Low FODMAP Recipes & Support when it had 10,000 members and it was excellent. The admin team are exceptional and are keen to promote dietetic input and scientific research around the low FODMAP diet. This group must be going from strength to strength as it now has 35,000 members (plus)! and although I am no longer actively involved I hope it is still just as good so check it and and see what you think.